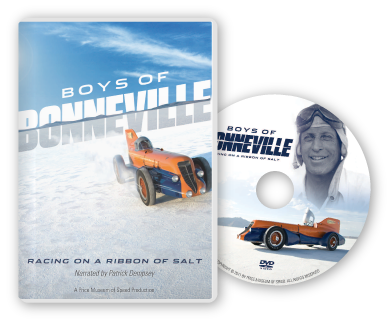 Boys of Bonneville Movie Trailer from Price Museum of Speed on Vimeo. Foreign orders will incur additional shipping charge. Ships in 1 week (domestic) or 2 weeks (international). When it comes to “car films” you can count really great ones on one hand. Add Boys of Bonneville to that hand. 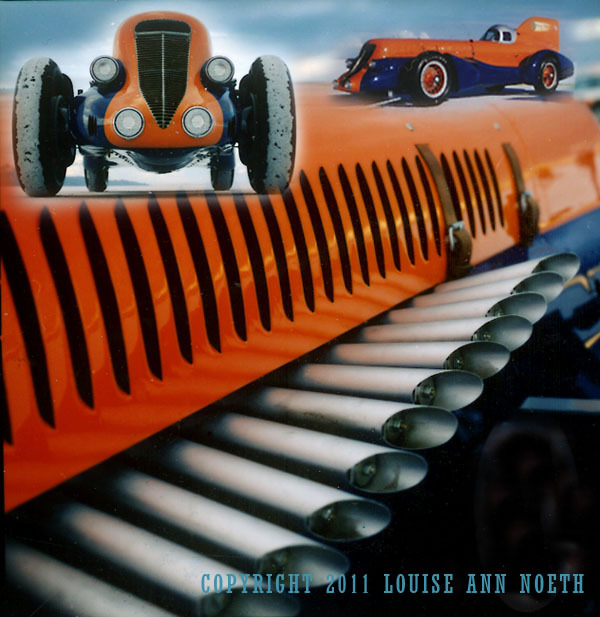 Because I have such a “Lioneess” proective approach about land speed racing and its people I get pretty cranky when TV and film folks screw things up and then run for cover screaming “creative license” — especially when I helped them out one way or another. In this case, I was rather pleased with how things turned out. And in the spirt of full disclosure, understand that I was interviewed for this documentary and appear on screen. That aside, this wonderfully crafted documentary has absorbing historic footage combined with a fine cross-section of folks who speak with authority (Hugh Coltharp, Gordon E. White) and sometimes only awe (Jay Leno) about David Abbot (Ab) Jenkins (1883-1956) whom many steadfastly believe is the “Father of salt racing and his son, Marv Jenkins. It was Ab’s dogged determination that put the Bonneville Salt Flats on the international racing map, not to mention the hundreds of speed marks he set there proving the salt’s worth. Considering his limited resources, Jenkins racked up remarkable achievements. What distinguished him from his contemporaries was his precise use of local, “tribal” salt knowledge and unlimited guts. He was a deeply religious man who put his faith in God, and by God, he went far. Jenkins was often oxymoronically called “The World’s Safest Speedster” because he set more world records than any other driver, past or present, yet he was prouder of his million-mile “no accident” street driving record than all his speed and endurance records combined. His watchwords were simple: Safety First. Moreover, the vintage film footage shows first-hand what a relaxed champion he was — exiting his Bonneville Salt Flats racing machines after a grueling 24-hour endurance run as though he were climbing out of a limousine on Broadway. 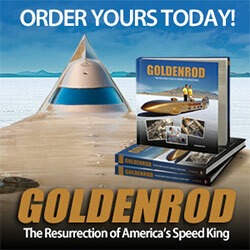 It took several decades later to topple Jenkins exhausting, 48-hour endurance record. As for the marks that have fallen, it required the efforts of several drivers compared to Jenkins single-man driving shows. However, many still remain intact today. One-time considered Utah’s “one-man public relations machine,” Jenkins racing fame got him elected Mayor of Salt Lake in 1940 without ever giving a speech, or spending a nickel on a campaign. He served until 1944. I am grumpy about one glaring omission . . ., The film doesn’t explain how, after setting dozens of speed records with the Pontiac Series 860, the General Motors decided to rename the car the “BONNEVILLE” in honor of Jenkins stunning achievements with the car — at age 76 no less. Find me a senior citizen race car driver today with such a pedigree. Stirling Moss, maybe, Andretti is too young and Nigel quit driving years ago. As far as I know, and I have been asking this question for more than a decade without getting contradicted, the Pontiac Bonneville is the only car to have EARNED its name and not simply be given its name by the sales and marketing people. Ab Jenkins was the certainly the first person catch “salt fever” and luckily he passed it on to succeeding generations with a need for speed. When Jenkins died at age 76, on August 9, 1956, the world was a little slower for him having done so.